Come to our free DANVILLE HERITAGE FESTIVAL, this weekend, July 20-22, a unique celebration of our town’s and our region’s history, culture, and traditions that will feature living-history demonstrations, interesting, well-informed speakers, and live music throughout the weekend. In addition to our website at http://danvilleheritage.com, this blog is interactive: through its comment sections, you can help by participating, giving the advice we need, and getting the information you want about this great festival. I just got word that there will be a working telegraph communicating between two locations at Hess Field this Saturday. Festival visitors can come and see, in action, a working telegraph, the great communicator of the nineteenth century! Chris Shipe has been leading the effort to create for the festival as many activities for children as possible. Sis Haus has been organizing a great lecture series. Jane VonBlon has managed to pull off what will be a great parade! We have lots of volunteers working hard to make 2018’s one of the best festivals Danville has ever celebrated. This year’s Danville Heritage Festival is not meant to take the place of Danville’s longtime and very popular Iron Heritage Festival. Rather, I’m organizing volunteers, hoping to preserve a desire for celebration that has become a July tradition in our town. It’s my hope that the festival will serve as a focal point of other community celebrations, open houses, class reunions, block parties this week, July 20, 21, and 22. It’s a grassroots effort, and I welcome your participation. If you'd like to offer musical, historical, or other presentations, please reach out to me at vanwags@yahoo.com and explore the schedule pages above. The initial focus will be in the Hess Field recreation venues along Route 54 in Danville, but if we reach a point where the Hess Field schedules become filled to capacity, please consider exploring other local venues. Churches and social organizations that have the facilities may well consider opening their doors to help host heritage activities over the July 20-22 weekend. In addition to the events taking place at Hess Field, the Thomas Beaver Free Library and other locations will have excellent speakers as well. If you do plan an event and would like it added to the listings above and on our website, I invite you to send the event’s details to me via the contact information on our website at http://www.vanwagnermusic.com/danvilleheritage.html. Danville and its surrounding area truly enjoy an amazing history. The knowledge and talent of local historians, musicians, and other performers is unparalleled. The community has shown that we want to celebrate this heritage. So I encourage you to please mark your calendar and be a part of this exciting new chapter as we all celebrate the Danville area’s amazing story. This weekend, Danville is where you belong! After speaking with local historian Sis Hause, I want to embrace health and wellness as much as possible, along with our heritage celebration. With the Geisinger Health System one of our community’s most important institutions, I can’t imagine a more fitting theme. The bicycle path around Hess Field is the oldest rail-trail in the United States. I encourage people to consider walking or biking to Hess Field for the festival. We want to organize health and fitness events. There are plans to organize a skateboarding and scootering event, a 5K run and walking event, tennis and quoits tournaments – and MORE! – as part of the festival. Embrace this chance to promote health and wellness while celebrating our heritage. LOVE A PARADE! JULY 20 AT 7 P.M. The Danville Heritage Parade, which will begin at 7 p.m. on Friday evening, July 20, will form next to the Anytime Fitness studio at the corner of one-way East Market Street and Railroad Street, stepping off along our town’s traditional and longtime route, down to its intersection with Mill Street. Anytime Fitness will enter a 'float in the parade, which will turn right on Mill Street, led by the Allentown-based Hobo ‘Almost’ Marching Band and including among its participants a canal boat and a historic Stuart Tank that was made in Berwick during World War II. At the end of their parade, the marchers will turn right again for a block on Lower Mulberry Street, and then they will finally turn right into Ferry Street and disband in the lot of the Cole’s Hardware Store. At that point, Cole’s will host a block party for everyone. The Sons of the American Legion, Post 40, and the Legion Auxiliary will sponsor the Stuart Tank and also the canal boat, originally from Point Township and normally berthed now at the Muncy Historical Society. The legion’s honor guard, with its flags flying, will step out at the parade’s front. Watch for World War II motorcycles and World War II re-enactors. Also in the parade, the Salamanders DJ Show and Karaoke will enter a float, according to organizer Jane VonBlohn, who expects classic cars and antique automobiles to ride along. The Four Girls Bakery – the Bartholomew sisters – plans to bring their cart and may sell or hand out cupcakes along the way. Among others in the line of march will be Mahoning Township constable Eamon Shoff , the Komotion dancers, Dave Decoteau and his student mountain bike riders, another bicycle group – the Victorian High Wheelers, and Music Box students in the long line of marchers. If you want to be in the parade, email the parade organizer Jane VonBlohn at jvonb@ptd.net. or just tag along and enjoy it. 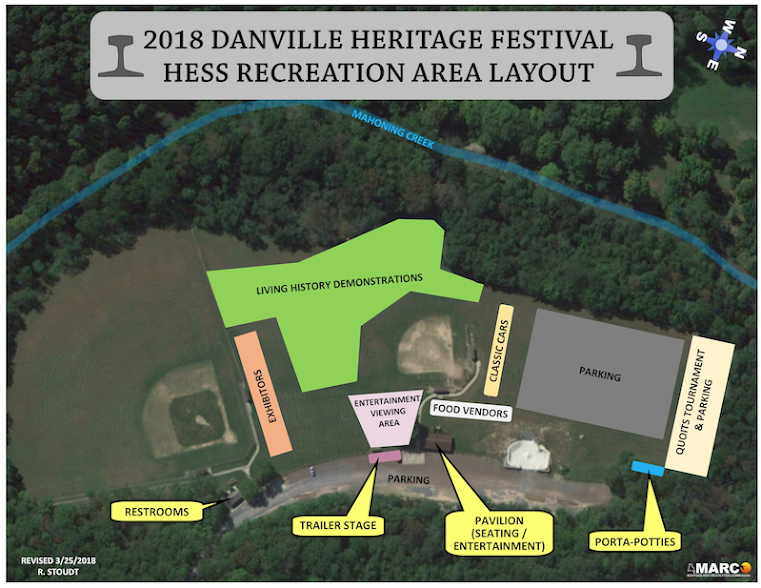 This summer’s Danville Heritage Festival this week will begin Friday and continue through Sunday with athletic events, exhibits, demonstrations, informative lectures, food, and fireworks. Many of the events will be at the Hess Field recreation complex along Route 54 behind the Perkins Pancakes restaurant, but the historical lectures will be in the air-conditioned comfort of the Thomas Beaver Free Library at the corner of East Market and Ferry streets, and a longtime hands-on exhibit of operating and historic model trains will be at Christ Memorial Episcopal Church, also air-conditioned, from noon to 4 p.m. on Friday. A big parade on Friday at 7 p.m. will follow Danville’s traditional parade route along East Market Street, down Mill Street, and climaxing in the Cole’s Hardware parking lot on Ferry Street where there will be a joyful block party for everyone. All of the events, their schedules, background information, and Danville history essays are listed on a new interactive web blog, easy to use and created for the festival by Bob Bomboy and his company Special Project Associates at https://danvilleheritageblog.blogspot.com. One of the blog’s features is an interview, recorded before his death, with Danville resident Cy Kelly, who endured the heat and danger at the big iron mill downtown where the Danville Middle School now stands. Among the events and displays on Saturday will be a 5K walk and run beginning at 8 a.m. Saturday, quoit and tennis tournaments, a car, truck, and motorcycle show all day, a bicycle tour at 10 a.m., continuous music performances from 10 a.m. to 4 p.m. on the Hess Field stage, real cannon firings and demonstrations at 10 a.m., noon, and 2 p.m., and demonstrations all day, including, traditional woodworking, archeology, a discussion of Pennsylvania canals, and a limestone burn. Also on Saturday, beginning at 10 a.m., at the Thomas Beaver Free Library, Sis Hause and Lynn Reichen will talk about Thomas Beaver himself. Other lecture topics: Dale Reiner describing the islands of the Susquehanna at 11 a.m.; Ethan Hron at noon talking about what it means to be a blacksmith; Jason Daryman at 1 p.m. on the history of the Pennsylvania slate industry; and, at 2 p.m., John Mazich’s exhibit of Danville’s rare historic photos. There are also essays on the blog about Danville’s primeval woods, animals, birds, and fish. 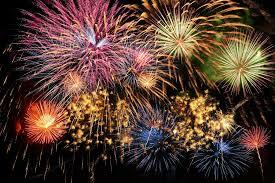 Luring adults and children alike, fireworks will blaze up over the river when it gets dark on Saturday night. There will be guided tours of two beautiful gardens beginning at noon on Sunday. Also a hymn sing by the river, and, at1 p.m. in the Shiloh United Church of Christ on Bloom Street, a slide show of tombstone curiosities in our local cemeteries. “We have lots of volunteers working hard to make 2018’s one of the best festivals Danville has ever celebrated,” says Van Wagner. The Susquehanna River once teemed with American shad each spring. That anadromous fish migrated from the Atlantic Ocean to the freshwater streams of the Pennsylvania interior for spawning. These fish swam up the Susquehanna by the hundreds of millions, providing a valuable food source for people as well as wildlife predators. Shad continued to migrate up the Susquehanna until the early 20th century when hydroelectric dams on the lower part of the river blocked their passage. Although an occasional shad makes its way through Montour County, its presence is a far cry from shad's one-time numbers. In the fall, this same river would once again teem with life as millions of American eels migrated down the Susquehanna and eventually to a part of the Atlantic Ocean called the Sargasso Sea, to spawn. By the late 1800s, these catadromous fish were caught on an industrial scale and were served as a delicacy in the finest restaurants. Evidence of “eel dams” or “eel weirs” can still be seen at several points on the Susquehanna including just below the Route 54 bridge in Danville. As the eels migrated downstream, they would be channeled to the point of the downstream-pointing “V” of the dam, where they dropped through a small opening to a net or platform. The lower Susquehanna hydroelectric dams brought the same fate to the American eel as they did to the shad, and eels rarely make a local appearance today. An occasional moose, sometimes called the black moose, could be found wading in the shallows of the river. It is difficult to get an accurate count of moose numbers in Pennsylvania; however, it is certain they were here. The last known Pennsylvania moose was killed about 1790 near the Juniata River. Farther back from the river, on the flats where many local towns now exist, occasional woodland bison (or buffalo) may have been found. These bison were a close relative to plains bison; however, they were a separate species. Unfortunately, these animals are now extirpated. Some researchers claim that these bison once migrated from the Shenandoah Valley of Virginia to a wintering ground near Lock Haven, Clinton County, with the main route of migration following the Susquehanna to Snyder County then northwest. There is a legend that the last Pennsylvania bison was killed in 1801 by Colonel John Kelly (near Buffalo Crossroads, Union County, Pennsylvania). New research suggests that this legend may not be true. Regardless, biologists do agree that occasional bison were found in parts of Pennsylvania before the 1800’s. The elk was one of the most important animals of the Appalachian Mountains ecosystem, though it is now extirpated from Montour County. Also called the Canadian or Pennsylvania stag, these animals were numerous throughout the area's ridge tops. By the 1870’s, they were completely extirpated from Pennsylvania, although they have since been reintroduced into western parts of the state. One of the main predators of elk was the panther. Also known as the mountain lion and catamount, these amazing hunters were common throughout the Commonwealth. Although occasional sightings are still reported, they were officially considered extirpated from Pennsylvania by the late 1800s. One of the last Pennsylvania mountain lions is mounted and is on display in the Pattee Library of Penn State University. Another predator in Penn’s Woods was the “black” wolf - probably the same species as the timber wolf. Wolves were essentially extirpated from Pennsylvania by the late 1800s, although a lone pack was reported to survive in the Seven Mountains region of central Pennsylvania until 1909. Their niche has since been reoccupied by coyotes, which were surprisingly scarce when wolves dominated the area. Even the forests themselves have changed. The virgin forests of Montour County were thick with white pine stands. These white pine trees were often more than 200 feet tall and could range up to 8 to 10 feet in diameter. White pine of that size is rarely seen in this area today, mainly because of the unsustainable logging of the 1800s. In addition to the giant pine, there were vast groves of American chestnut. A Penn State researcher has found evidence that locally there were five American chestnut trees for every oak tree. A study in 1911 found that 22 percent of Montour County was covered with American chestnut trees. Today, very few American chestnut trees grow more than a few feet tall before being killed by a fungus known as chestnut blight that came from Asia in 1904. There's an additional surprise when looking into the current “residents” of our area streams and forests. It is nearly impossible to find a field, stream, or forest without dozens of examples of invasive and exotic species. Some examples of species not originally found in Montour County include carp, dandelions, tree-of-heaven (Chinese sumac), pheasants, all trout except brook trout, and smallmouth bass. Those in bold are not originally from North America. We will never again see what our virgin land looked like. It is also important to realize that environmental degradation is a slippery slope on which changes are still occurring. 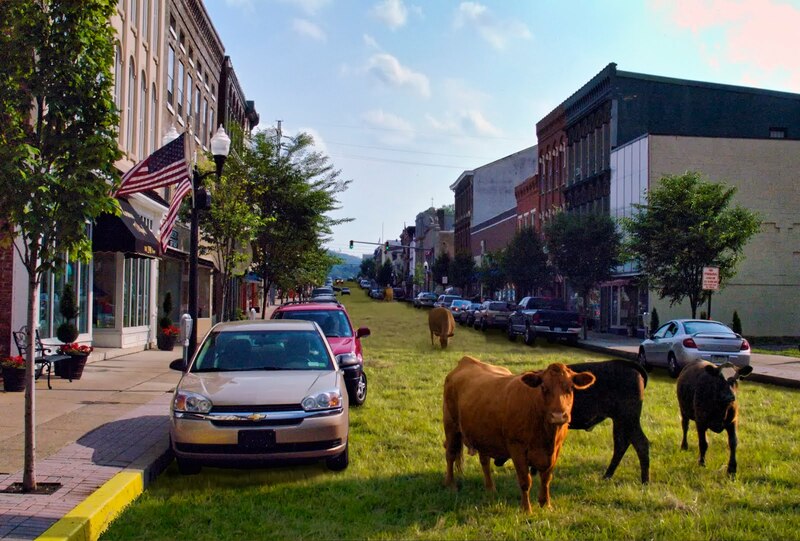 As more and more of Montour County’s rural areas become developed, the loss of more species and natural rhythms is likely. It is our responsibility that future generations will not look upon the black bear, timber rattlesnake, brook trout, and eastern hemlock the same way that we look upon the woodland bison, elk, and American chestnut. Anadromous fish - A fish that lives in salt water and migrates upstream into fresh water to spawn. Catadromous fish - A fish that lives in freshwater and migrates downstream to spawn in salt water. Extirpated - extinct from a portion of its range. “What Might Have Been” by Brian Halbleib, March 2005, Pennsylvania Game News. 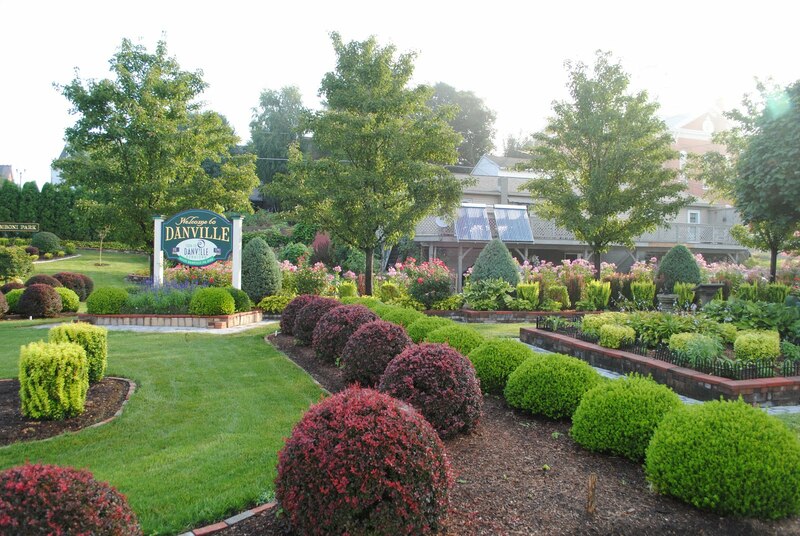 Human beings have lived in the Danville area for thousands of years, and the area has been known by many names. The Susquehannock, and later the Delaware, Indians lived here for centuries. Unfortunately, we know very little about the people who lived here before that era (about 1,100 AD). By the late 1700's people of European and African-American backgrounds began settling here. Some native people stayed and assimilated into the new culture; however, many moved west with thousands of other native peoples. Many of us living in the region today can trace our ancestry back hundreds of years. In the late 1700’s, almost the entire economy of the region revolved around agriculture. The idea of owning land was something most immigrants had only dreamed of in their homelands. In America, the dream of owning and farming their own land became a reality. Our farmers not only raised crops and animals for trade and sale, they also had to be expert woodsmen and stone masons, and know other skilled trades. Many built their own homes, barns, and churches. The Susquehanna River was their main avenue of travel and export. There were four kinds of river rafts. The first was a "spar raft" made by lashing tall, straight White Pine tree trunks together. Other raft types included: a "timber raft" made of squared White Pine logs; a "lumber raft" consisting of logs that had already been sawed into lumber; and lastly "arks" that had flat bottoms and were built to carry cargoes such as coal, grain, or other goods from the interior (see "The Long Crooked River"). By 1796, rafts from the North and West branches of the Susquehanna were making trips downstream, some floating onto the Chesapeake Bay and traveling as far as Norfolk, Virginia (S. Stranahan). Over the following few decades, that commerce escalated until the river became what we would call today a superhighway of rafts. For example, between the 18th and the 23rd of May in 1833, imagine standing on our riverbank and watching 2,688 arks and 3,480 rafts float past Danville! That averages more than 1,000 rafts and arks per day – a raft or two every minute of the day! Their cargo was mostly grain and lumber (Intelligencer 6/14/1833). William Montgomery, a widely known patriot and colonial leader even before the Revolutionary War, bought this land on the Mahoning Creek in 1774 and, two years later, moved his family here from Chester County. 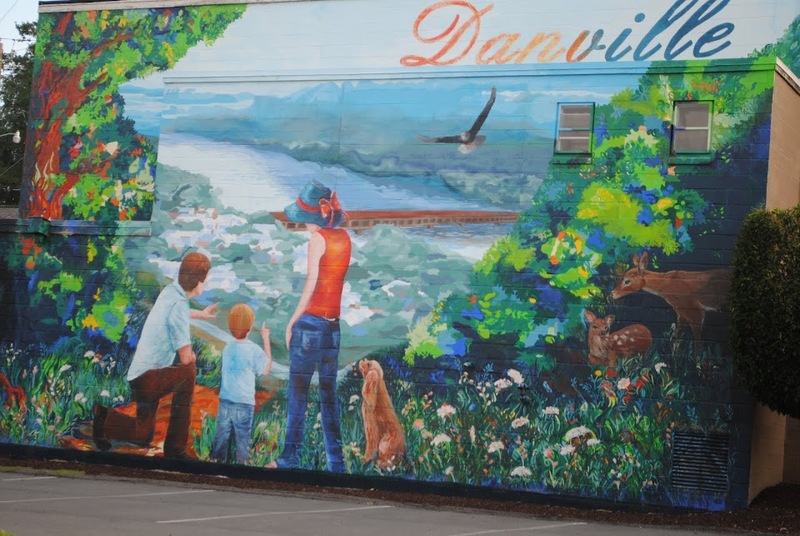 It would come to be called Dan’s Town, named for his son, Daniel, and became Danville in 1801 when the government established a post office here. These mountains held limestone and iron ore, and by the 1830’s a budding iron industry was developing here. Pioneers built outdoor furnaces to smelt our iron ore into cast-iron products and pig iron for export (you can see or hear about some of these iron furnaces during our festival weekend). The earliest furnaces burned charcoal, but by the late 1830’s several local furnaces were using anthracite coal – among the nation’s first furnaces to do that. During the same period the Pennsylvania Canal came through Danville, making it less expensive and more efficient to export our agricultural and industrial goods. The canal also floated thousands of tons of anthracite coal downstream from Pennsylvania’s Wyoming Valley to our Danville iron furnaces. A major development came in the 1840’s as the innovation of iron rolling mills. The rolling mills molded hot pig iron into malleable balls and fed them through a series of squeezes, making easy-to-transport and re-manufacture wrought iron. Among that era’s most notable innovation was the Montour Iron Company’s rolling of the first T-rail in America on October 8, 1845. The T-rail revolutionized transportation, because, with its broad flat foot, it was the first rail design that could dependably carry the extreme weight of railroad locomotives. Danville’s T-rails built some of America’s coast-to-coast transcontinental railroads. Our iron industry had its ups and downs for decades until, in the 1930’s, it finally declined. A combination of the world’s transition from iron to steel and the onset of the Great Depression brought to an end the era when iron was king in Danville. Some metal manufacturing still thrives here today, but nothing like the century when thousands of men and boys labored at the coal-fueled furnaces of Danville. One of the entrepreneurs who best understood the iron and coal boom was George F. Geisinger; he was very successful and earned a fortune. After his death, his widow, Abigail Geisinger, used a million dollars of his money to fund the construction of the Geisinger Hospital, which opened in 1915. The hospital was and still is among the nation’s leading health care organizations and has grown into the widely recognized Geisinger Health System. I prefer not to view our history as a series of “starts and stops,” but rather as a continuum of the human story. Danville did not begin with a “founding” after the Treaty of Fort Stanwix in 1768. Rather, it has been home to our fellow man for thousands of years and will likely be so for many more. WE ROLL THE SIDEWALKS UP AT NIGHT TOO!! DANVILLE HERITAGE FESTIVAL 2018. Simple theme. Powered by Blogger.